I always seem to leave my art making in the studio, but this time I packed a little sketching kit to take with me on my travels. I've never sketched in public, so bravely I thought it was time to put my big girl pants on. 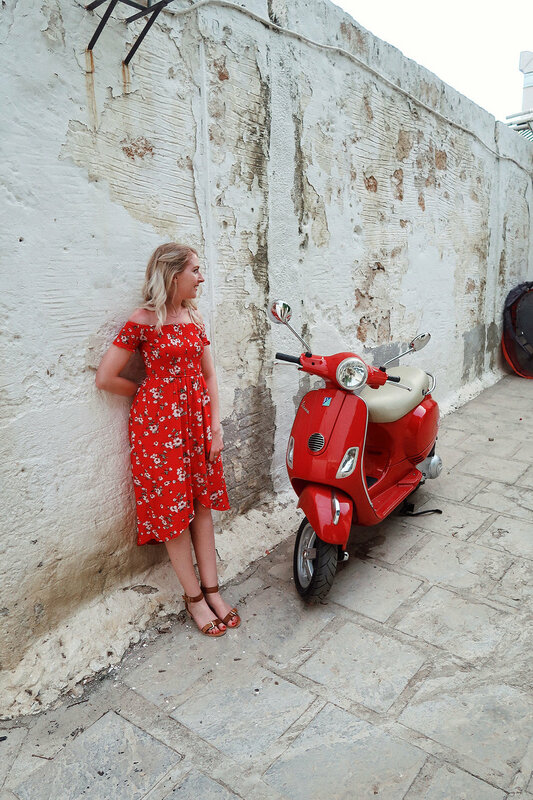 We travelled to Rhodes, Greece. This was my third Greek island I have visited, after Crete & Kos. (Santorini & Kefalonia are next on my wishlist.) We stayed in a little self-catering apartment right on the ocean, so we could travel and taste lots of traditional Greek menus. The first day, we spent recuperating on the beach. I took down my sketchbook and watercolours. A couple of people stopped and chatted, asking me about my art and whether I want to be a 'Picasso' (rolls eyes). But it was nice to see that other people are interested in art and I even overheard a few 'you could have brought your sketchbook, like that girl'. 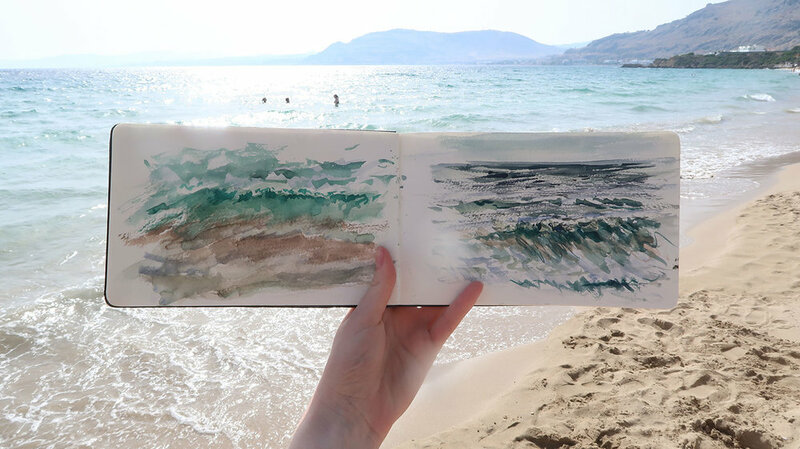 This made me super happy, to think that I might have inspired somebody else to art on holiday. My art kit consisted of a Moleskine watercolour sketchbook, Mijello 12 pan watercolours & a watercolour brush pen. In fact, many times I used the water from the ocean to fill my brush pen. I wasn't sure how I'd get on carrying it around, but it worked out great. I put my brush pen inside my palette, so it didn't get lost, and it all fitted in my little bag. Now I know how easy it is, my plan is to take it out a lot more. Even just for coffee shop visits etc. Of course, most of my sketchbook paintings are of the sea. But there were lots others inspired by Greek life & holidaymakers. The mix of Greek tradition, and unicorn inflatables. By morning the sea was a lush, vibrant green/blue. By afternoon, a calm, still body of water. This gave me plenty of interesting options and subjects, especially the reflections of people in the sea. Most of these paintings are a mix between watercolour and gouache. The basic watercolour sketches were done on my travels. Then defined in the studio with more details. I'd really love to know if you've ever tried painting on your travels. If you haven't, will you try it next time? Scroll to the bottom of this post to watch a video 'flick-through' of my travel sketchbook.